Tomorrow, I'll ship three new images to Plum Bottom Pottery & Gallery in Egg Harbor, WI. "Spring Fantasy" is a combination of water color and pastel.on watercolor paper. "Summer Breeze" is soft pastel on Wallis paper. I really enjoyed that surface but it is no longer being made. 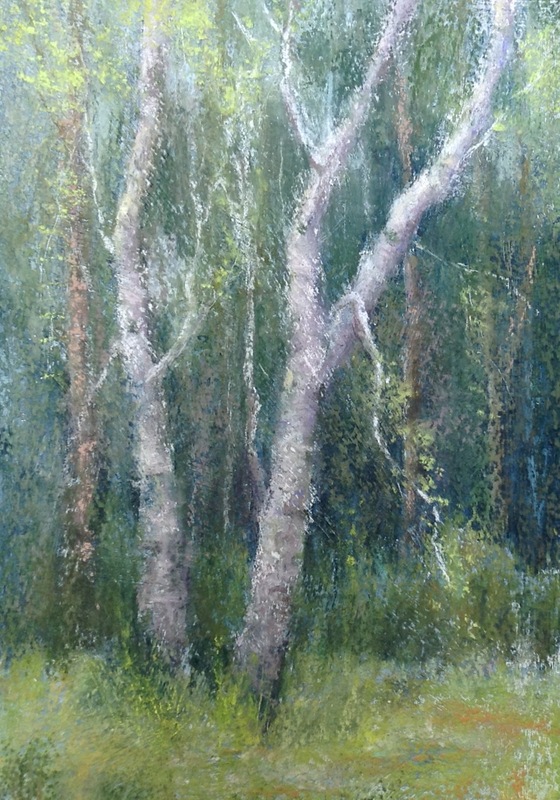 A "Familiar Friend" was inspired by a birch tree growing on Plum Bottom's property. It is an older tree and has seen better days but I love it's character. Instead of using traditional pastel paper, I brushed a pastel ground mixture onto 300 lb. cold pressed watercolor paper. When the pastel was applied to this rough surface it emphasized the brushstrokes of the dried pastel ground. This is a different direction for me. Let me know what you think of it! All three pieces are smaller sized, matted and ready to be framed. They also can be easily shipped. Because many people like to choose the frame to complement their decor, I've been trying this format with Plum Bottom. "A Familiar Friend", 10" x 6.5"
Hope you're enjoying the last days of summer and thanks for checking in!